Mid 1st: Marshall gets a hit but no damage done. 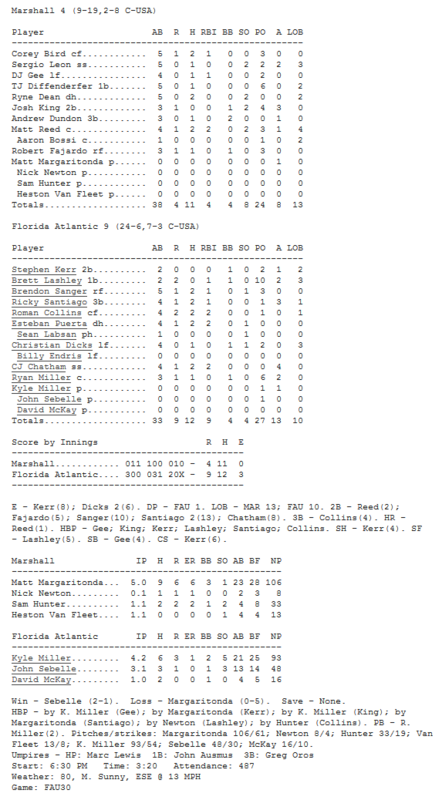 #FAU 0 Marshall 0. Runners on first and second for Santiago w/0 outs after Lashley and Sanger drew back-to-back walks. Bases loaded. 2 outs. Esteban Puerta in the batters box. BOOM!! Puerta with a bases clearing double to give #FAU a 3-0 lead after the 1st inning. Mid 2nd: Drew Jackson allows a base hit but nothing more. #FAU 3 Marshall 0. Due up: 8. Chatham, 9. Abraham, 1. Kerr. End 2nd: Owls leave a runner stranded on second base. 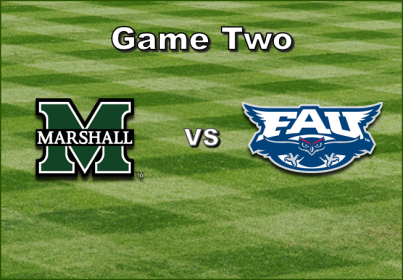 #FAU 3 Marshall 0. Jackson still on the mound.